For their mobility semester, all MEi:CogSci students have to spend their third semester abroad at one of our parter universities. However, MEi:CogSci students and the programme coordinators start organising the mobility semester already in the first semester. In the beginning of December MEi:CogSci students and the MEi:CogSci consortium members (professors and coordinators) from all partner universities meet at the Comenius University in Bratislava. At the info meeting, each partner university presents its local MEi:CogSci mobility semester implementation and highlights some of the available options for project work and specialisation. The information provided will help students to chose preferred partner universities for their mobility semester. Furthermore, students from all the partner universities meet for the first time. After the info meeting, all students and consortium members are invited to spend the evening together at the christmas market in Bratislava. You can take the train from "Wien Hauptbahnhof" to "Bratislava hl.st." 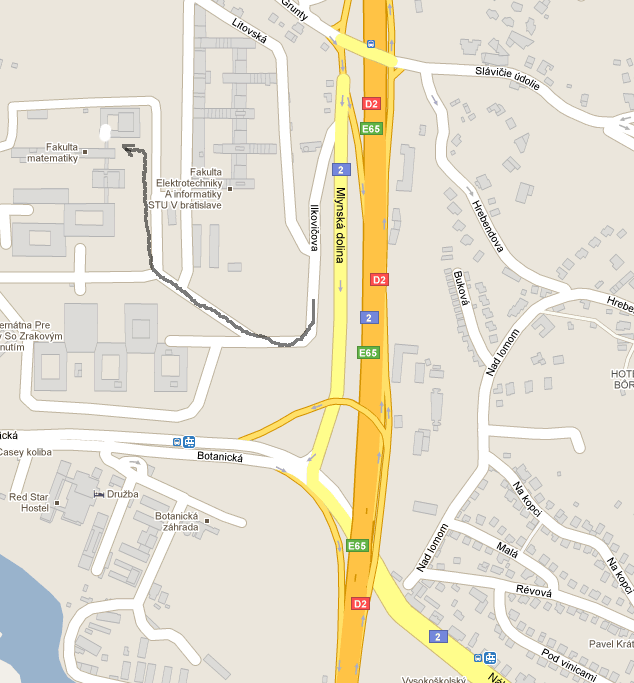 and then take the bus 32 to the University (stop: Botanicka Zahrada, then walk to the faculty). The OEBB Bratislava-Ticket (for outward and return travel) including public transport in Bratislava is offered for 16€. You may also have a look at the annual Budapest Semester in Cognitive Science. Students rank the partner universities for the mobility semester according to their preferences. After the mobility semester info meeting you will receive an email with a link to an online form. You fill in some personal information (name, matriculation number, email address, home university) and rank the partner universites (first/second preference). The deadline for submitting the online form with your preference ranking is 31 December. There is a limited number of places available at each partner university. That is, it is not possible for all students of a local cohort to do their mobility semester at the same partner university. Students need to be distributed equally among the partner universities with respect to organisational constraints. The programme coordinators will inform you about the number of places available at each partner university. Students should negotiate a fair distribution with regards to students’ interests amongst themselves, i.e., their local cohort. Please take into account that some of your colleagues might need to see a doctor regularly, may have children, need to work to finance their studies, etc., and therefore may have a clear preference for going to a certain university. In case the number of students exceeds the number of places available at a specific university, the programme coordinators will inform you and ask you to discuss the situation among your cohort. You can also ask the coordinators about alternative suggestions for partner universities with respect to your interests. If the conflict cannot be resolved, the coordinators will resolve the conflict by means of randomisation. After the distribution of students among our partner universities has been finalised, students apply for an Erasmus+ scholarship for their mobility semester by registering at the Erasmus+ database of the University of Vienna: erasmus.univie.ac.at. The programme coordinators will inform you about this via email. Be aware of the Erasmus+ application deadline on 15 March. Information about Erasmus+ student exchange for outgoing students is provided on the website of the international office of the University of Vienna. Information sheets/Checklists are available in the download section. You will receive an email by the Erasmus office after you have been nominated for an Erasmus+ scholarship. The email contains instructions for finishing the application procedure at the home and the host university. Attention: Application procedure starts 1 April 2018 and ends 15 June 2018. Website will be updated. Use the "Ausfüllhilfe" (which you receive via email by the Erasmus office) to fill in the online form. In addition, this document helps you to fill in the data for "Heimatuniversität" (home university) and "Gastuniversität" (host universitiy). The academic semester start and end differ across universities. We suggest that you fill in a period of six months in your Erasmus+ form (independent of the specific semester period of the partner university). You can start your stay earlier or stay longer than the official semester period(s). Upload of your language certificate fails if your document is too big in size (bytes). In this case reduce the size of the document, i.e., reduce dpi and/or colors, compress the PDF, etc. and try to upload it again. This document helps you fill in the OLA. This document helps you fill in the National Sheet. Start to think about your project work and potential supervisors at the end of the second semester. We recommend that you try to contact potential supervisors for project work before the mobility semester starts. Three types of learning contracts are available for the mobility semester. The type of learning contract depends on the type of project work you are doing. In case you are doing two projects copy the sections from point 3 and paste them as point 4. In case you are doing two different types of projects, copy the sections from the relevant type of the Mobility Semester Learning Contract document. Please be aware that you need to have acquired 45 ECTS of the first year before you start your mobility semester. The deadline for your initial learning contract is 31 October. Send your mobility semester learning contract via email to the programme coordinators of (1) your host university, and CC to (2) your home university and (3) your project supervisor(s). You will get feedback whether the learning contract is formally approved or requires revision. You have to extend your Erasmus+ mobility semester in case you would like to do your master's thesis abroad. Get informed about the required procedure and deadlines for Erasmus+ extensions. In case you extend your stay, you need to attend the master's thesis seminar at your host university, include it on the learning contract and bring a transcript for it at the end of your stay. If you want to extend your stay without being able to receive an Erasmus+ scholarship, please contact the local coordinators for possibilities. Be aware that without extension you will loose your student status at the host insitution. Deadline for the mobility semester learning contract is 31 March. This date has been set by the international MEi:CogSci consortium. If you miss this deadline, we cannot guarantee that you can successfully finish your mobility semester. The University of Vienna accepts scans of signed and stamped learning contracts if (1) they are send by the local coordinator (or the person who signed the learning contract on page 2) from their university affiliated email address to meicogsci@univie.ac.at and (2) scans of all relevant transcripts for courses on the learning contract are included in the email. Alternatively, you can bring the (1) original, graded, signed, and stamped mobility learning contract and (2) all relevant transcripts to the programme coordinators in Vienna. Your grades will then be recognised and transferred to the University of Vienna and appear on your transcript of records/ in U:Space. We will send a scan of the Learning Contract and transcript to the International Office to confirm the recognition of your courses. You therefore do not need to send the "Learning Agreement after the mobility" to the International Office. In case you have extended your mobility semester the deadline can be postponed (in case your supervisor agrees). In this case contact the programme coordinators by end of January. If you face any issues, please make sure to contact the programme coordinators as soon as possible! Please note that after you missed the deadlines (e.g. for the learning contract) we can unfortunately no longer be of assistance due to organisational/legal reasons.